Last year I had this wild idea sort of land in my head the way you see a random leaf fall from a tree and land softly on the ground. This idea landed in my mind and sort of marinated if you will and within a few days of tossing it back and forth I had to call someone and bounce this said idea at them. I remember calling my friend Priscilla and telling her my idea to make homemade baby food fun for both the baby and parent. Priscilla thought it was a great idea and thats all I needed to jump head first into a whole new realm of sharing information. Sometimes that is all you need. Someone else to say “Yes, that sounds incredible! You aren’t crazy, you are creative!” and then you are off and running into a direction you were scared at first to run in … but as you run quick into this new direction it is that support from others that acts as the wind propelling you forward. When I started this blog Baby Boy Bakery I wanted to A. Make Friends and B. Share The Recipes I Was Making. It just so happened that when I started my blog, my son Ryan was just embarking on his solid food chapter of eating. 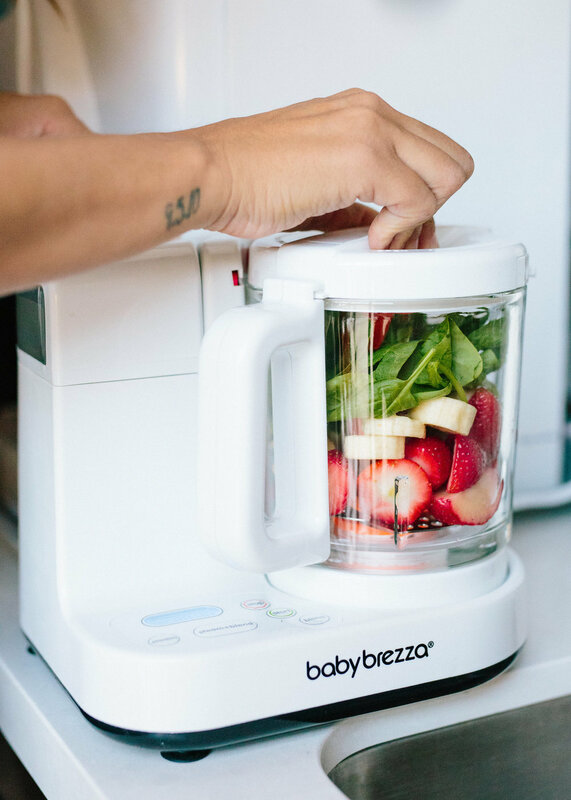 I knew from the get go I wanted to make all his baby food at home in my kitchen. Just because I wanted to control every morsel that went into his body and well ya I was a first time paranoid parent. (Cut to Mila eating a stale sweet potato fry she found in her car seat recently, come the second kid things just don’t seem that bad.) Anyways, I started sharing my homemade baby food recipes on my blog and parents seemed interested and even tried a few on their own. Last year when Mila began her solid food journey my readers asked daily what Mila was eating so I posted a few baby food recipes and tips. You can search my blog for baby food and scroll through a whole slew of baby food recipe ideas. I love writing recipes and ideas for parents and sharing them on my blog or social media. Though what I was really craving was that in-person connection and felt like I not only wanted to teach a class but I could in fact teach a real class. Reading blogs is great, but getting to meet people and learn new things is magic and I just love love love my online community so much! I knew I had to think of a fun and inviting way to host a class. Since the majority of my questions revolved around what I fed my kids I decided to put together a class and add a few fun layers to it! Enter … Purees & Pop! Purees & Pop is my homemade baby food making class where I teach parents simple purees and blends that their baby can eat, but also can be tossed into a cocktail or sparking water for a delicious adult drink! 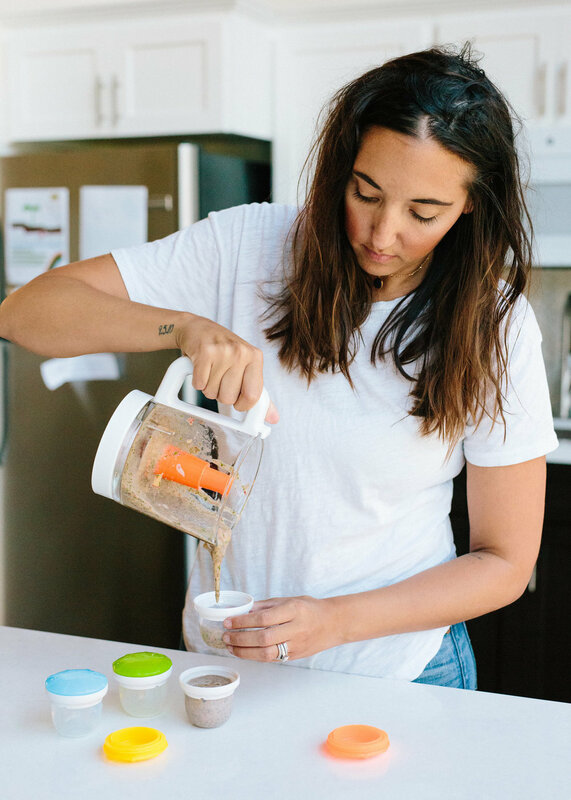 Parents learn the ins and outs on how to create baby food at home, as well as how to use certain homemade purees that pair well with spirits. Purees are not just for the baby you guys!! During the class I also go over how to store your baby food, what blends offer a well-balance meal for your baby and which fruit combinations make a yummy vanilla bourbon cocktail. You know, because parents deserve a little fun during meal time too. Ok, so don’t I do this all alone. My friend Priscilla who gave me the courage to start this class in the first place helps me organize the best class possible with the best brands and sponsorships possible! You can check out our #PureesandPop on Instagram to see all the fun we had last year. We had moms and dads attend, take notes and mingle with each other while they learned and sipped cocktails (and mocktails). It was so much fun that we are hosting a second Purees & Pop on July 27th! This second class will be just like the first but with a few tweaks for the better. 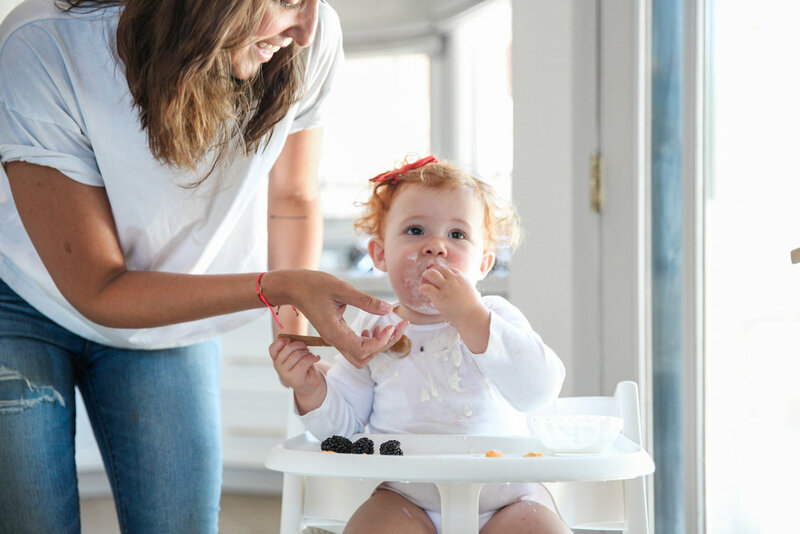 I have all new recipes and I’ve partnered with Yumi to have an on-site nutritionist to answer real deal questions from parents about the food they are feeding their babes. Our swag bags this time around are filled to the brim with goodies that include the Baby Brezza blender and Munchkin food containers you see here in the photos, Babyganics cleaners, EZPZ mats and much more! To say I am excited would be a huge understatement. I’m busy getting everything ready for our second Purees & Pop and I couldn’t be more thrilled! It will be a fantastic time. If you are interested in joining the fun check out our event page HERE and RSVP! All the brands and businesses involved with making this event fantastic donated their time and products. I could not be more grateful for their willingness to donate and because of their generosity the families had a memorable time. The venue was at Steelcraft which is an outside space surrounded by good eats, one of which is The Fresh Shave. (Along with The Fresh Shave, my favorite was Waffle Love!) Families were able to grab large tables, enjoy great food and free shave ice compliments of The Fresh Shave. Seedling donated various crafting kits for the children to enjoy while parents conversed with each other and ate! A favorite for me for sure, was seeing all the kids hard at work on their crafts while parents just breathed easy and throughly enjoyed themselves. Seedling is the cutest company who creates crafting kits for children! It was honestly the best idea to have them on each table for families to enjoy. Mila crafted her own mermaid tail! Others painted bird houses and fun jungle masks. Tickets to the BBB Summer Kickoff were donation based. So families were able to donate as much or as little as they wanted to the Dodger Foundation - RBI Program. I was blown away by the response as the event filled up within hours of my posting the invite on Instagram! It was quite an incredible feeling to know that families were willing to come together for a greater cause. I was offering them nothing other than a great time. It truly is a testament to how giving people can be and watching 75+ families who came together at my BBB Summer Kickoff was a humbling experience. Together we were able to raise $700+ for the Dodger Foundation - RBI Program! Which for me is an astonishing amount considering it was an event pulled together by friends in such a short time. Again, my social community is nothing short of amazing! I decided to benefit the Dodger Foundation - RBI Program because to me Summer is all about baseball. I love the work this organization does for children in need within Southern California. 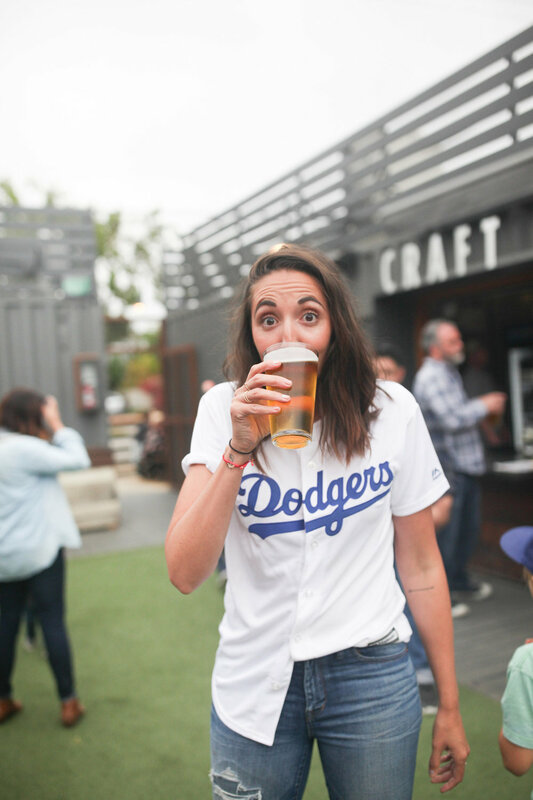 I also love the fact that the Dodger RBI Program is dedicated to using baseball as a way to engage and increase access to education, health, wellness and recreational resources to underserved communities. To learn more about their efforts and how you can get involved, go HERE. You can check the hashtag #BBBSummerKickoff to see the fun. Below are a few photos of my family enjoying time together and kicking off Summer in the best way possible! There is something to be said about a group of mothers who come together for a good cause. I am a firm believer of magic sparking when mothers support one another. Recently, at my brunch celebrating my Mother’s Day gift boxes benefiting No Kid Hungry, I physically saw the magic sparks. I am honored to share that beautiful day with you all. I am also thrilled to announce that my Mother’s Day gift boxes are now sold out and in turn we’ll be able to donate 8 thousand meals to No Kid Hungry. Honestly, it just doesn’t get much better than that! I wanted to share this beautiful brunch with you all. Some how posting it here will help me remember the beauty of that afternoon and the magical feeling. Special thanks to Starling, Gratitude Collaborative and Au Fudge for making this incredible event happen! When Cinepolis Junior came to me with their new movie theater built just for children I was thrilled! I immediately wanted to learn how it worked, what it would look like etc. I jumped at the chance to host a movie premiere event and invited my social community to come be the first to enjoy the theater. Cinepolis Junior is tucked inside with illuminating Lego doors that give off a magical feel. The entrance makes you feel like you are about to walk into something special and once inside you'll notice that you aren't in a normal theater anymore. The viewing seats are made up of giant bean bags and comfy padded lounge chairs. There is a giant space with play structures geared towards your littlest. While off to the side is what I can best describe as a dreamlike obstacle course complete with tube slides! When you come to Cinepolis Junior be prepared for play time prior to movie time, which I find so smart. Mostly because your children can get their wiggles out before sitting to enjoy a movie. At the movie premiere event my guests were lucky enough to view the upcoming Smurfs - The Lost Village movie. When it was time to watch the movie everyone nestled in and all became still. Though being a child's theater chatter during a movie happens through out and I'd say encouraged. Children are so curious and sometimes a movie can whisk them away to a far place. Movies do the same for adults too. My favorite was looking around the theater watching the children's faces including Mila's. The awe and wonderment is so sincere and melts my heart. My event with Cinepolis Junior was pure joy! For me, movie watching is much more than what it actually seems. When I was little my mom created 'Family Friday', where we all ate pizza and watched a movie together. We did this every Friday with out fail and to this day it is a tradition I carry out with my own family. Plus, when we visit my mom and our days happen to land on a Friday ... guess what we do?! Much like food and songs, movies make memories and memories for me are gold. I absolutely love Cinepolis Junior and the chance it gives for families to enjoy a movie theater outing with ease. I know I'll be planning a few Family Fridays at Cinepolis Junior! Aside from the incredible theater, my guests enjoyed a delish candy buffet and fun Baby Boy Bakery swag! Below are a few photos from my event, plus a few answers to frequently asked questions Cinepolis receives that may be helpful! To learn more about Cinepolis Junior go here. The Cinépolis Junior auditoriums opened in the Cinépolis Pico Rivera and Cinépolis Vista theaters Thursday, March 16. The Junior concept is not for the full theater. It is just one Cinépolis Junior auditorium in each of the Pico Rivera and Vista movie theaters. Can kids play during the movie? No. Kids will be able to play in the play structure and play area for 20 minutes before the movie begins. Lights will be on 100% at this time. At the 20-minute mark, a Cinépolis cartoon character will pop up on the screen and inform everyone that it is time to take their seats, and the lights will dim slightly. A Cinépolis attendant will also help guide everyone to their seats. The attendant will also stay in-auditorium monitoring the play areas so that kids do not play while the film is screening. Once the film begins, lighting will be reduced to what you’d expect in a movie theater when it comes time to watch a film. Cinépolis Junior is designed for kids ages 3-12 years old. Both Cinépolis Junior auditoriums will only screen child-friendly films (G and PG). This past Saturday I celebrated my July We Cook kit in style with The Land of Nod. The Land of Nod reached out to me in hopes of doing some sort of event together and I thought a Summer Bash would be fitting. 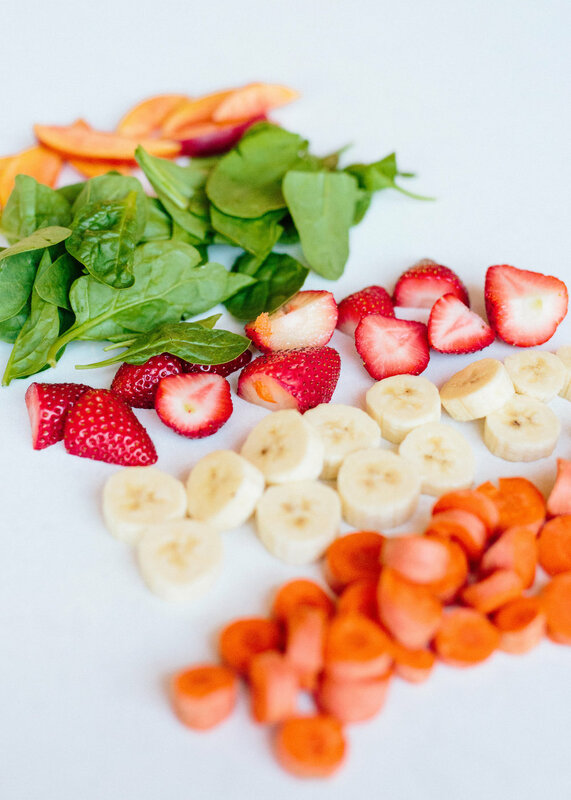 My July We Cook kit is all about frozen pops. This months kit comes complete with the best pop molds and a few of my most tastiest popsicle recipes. Summer screams frozen treats so I wanted to party with my fellow Baby Boy Bakery Kids! I came up with the cutest craft for the little ones. They decorated their own felt popsicle with various "sprinkles". Enjoyed popsicle cookies made by my dear friend Jenny's Cookies and beverages at the Lemonade bar. Plus, we had a raffle every half hour during the party which got everyone excited! Everyone who RSVP'ed came and a few extra friends did too. There was so much going, it truly was a Summer party. I was so excited to actually talk to parents in person about my We Cool kit and what they mean to me. I was able to talk about stories that involved my son and amidst the 50+ kids I definitely felt his presence. The chaos alone I'm sure Ryan throughly enjoyed. The Land of Nod store at South Coast Plaza in Orange Country is built to emulate a child's dream. All the surroundings were colorful and a multitude of toys are everywhere begging to be played with. My Baby Boy Bakery Kids were bouncing back and forth between playing, crafting eating sugar and playing some more. It was kind of awesome! I am always looking for ways to give back. There is nothing better than doing good for others in need. I’ve also found that when you are right smack in the middle grieving one of the best things you can do is give back. Whether it is for a charity or simply surprising someone with a tasty homemade dinner and dessert. For me anyways, it makes my heart feel whole when I usually feel broken. Doing good makes me feel good and I need all the feel good moments I can grasp. Back in July when Dan and I announced we were expecting our second child my readers and Instagram followers were more than supportive. Our online community filled of friends were so excited for us and eager to shed every ounce of support their souls could offer. It was amazing and my husband and I couldn’t believe it! So many of you have reached out to gift us things and offer words of encouragement and congratulations. We can’t thank you enough. In turn, I wanted to try and channel all your generosity for an idea I had . . .
With my due date around the corner it seems to be that time when baby showers are thrown for expecting mothers. I’ve decided to throw myself a baby shower but instead of receiving gifts for myself I want to received gifts to give to the incredible charity organization Baby2Baby. Baby2Baby provides low-income children ages 0-12 with diapers, clothing and all the basic necessities that every child deserves. I can’t help but think what a perfect opportunity this is to collect donations and give them to so many children in need! There goes my heart feeling whole again! I’ll be going into more detail about each and every one involved in the coming weeks. In the meantime, take a look at our invite below. There you can read about all the fun activities planned and the deliciousness you'll be able to enjoy. Please RSVP using the Eventbrite page link here. In keeping with the 'baby shower' theme there is a gift registry were all the items listed are the most needed by Baby2Baby. Once you RSVP, plan on coming with your unwrapped gift/donation ready to party with me for an incredible cause! When you find something that helps with handling such terrible grief you tell everyone you can. When you find something you love you scream it from the mountain top, right? You try to get everyone on board, because "You guys! I found this amazing thing and I'm telling you it is more than just what it seems...it is a million times more." That is how I felt after my first Soul Cycle class. It was about 4 weeks after I lost my son and my friend Elizabeth was inviting everyone to try Soul Cycle with her. I thought to myself, why not. It might make me tired enough to where I can actually fall asleep tonight. I remember thinking something about endorphins and endorphins are supposed to make you happy...I was desperate to feel anything but what I was feeling. And so I signed up. Soul Cycle is not a cure. Most definitely not. But what it does, is forces you to clear your mind and free anything that is weighing you down. It brings out so many emotions for me. I let myself feel everything, I keep all the good and toss all the negative aside. I cycle myself to a better me and for forty five minutes I can throw my entire being in that damn bike. I can be angry and take it out on the bike. I can be happy and dance on the bike. I can be sad, cry and scream on the bike. At the end I feel refreshed. I no longer feel defeated. My soul feels strong and for a few hours after I feel happy and OK with how my life is at this moment. When the Soul Cycle in Pasadena reached out to me and asked if I would like to host a ride for family and friends I jumped at the chance. You don't have to be going through something terrible to enjoy Soul Cycle. You can be the happiest and still benefit from this class. Anything you feel you take to Soul Cycle and you let it turn you into a better person. I wanted to share that with everyone. I wanted to share how amazing this work out can really be. It can be different for each and every one of us. So, I extended the invite to all my lovely Instagram friends too. We were blown away by the response! The night was something else. It was all things amazing and incredible to meet so many new people who have had our son on their hearts. The entire time my husband and I felt so blessed and we really did feel Ryan amongst us. All of it was beautiful and I hope to do it again in the future. Huge HUGE thank you to these girls. Everyone who works at Soul Cycle Pasadena is beyond nice. They made the event seamless and I love them. We also had the best after work out treat on the planet. Thank you to Sweet Clementine's Popsicles for making us delicious Lemon Buttermilk popsicles to enjoy after working our butts off. I hope everyone loved them. Also I wish I could always have one after working out! Dan and I wouldn't be where we are right now with our incredible family. We are thank God everyday for blessing us with such strong support. For our family we are grateful. Thank you to all the sweet souls who came to the event. Thank you for coming and thank you for becoming our friends through this pain we are experiencing. We are grateful and so happy to have shared this wonderful night with you all.